Hail Voyagers! Once more 'round the Sun and we've arrived back where we belong! 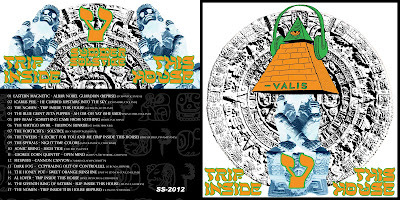 And, once again, we're here to bring you a psychedelic soundtrack to your Summer, 2012 style. I love each of the prior four volumes of this series in equal measure - like a parent, but make no mistake this is a precocious little edition. Out of the gate running! Yes, a Sun Gate. Sixteen bands, five countries, all took up the challenge and have given us their time and talent to bring you this. I'm forever grateful and hope you are, too. Let 'em know, in your own way, either via a comment here or direct contact via other means. Appreciation goes a long way. So, before the Solstice settles on Europa and the Isle just west, let's on with it! THANK YOU BANDS! It's been a privilege to have your participation. You make it possible. Unsure, right now, about a Volume VI. As has been said, "tomorrow never knows..." Enjoy what we have here and have a great Summer everyone!!! PS Thanks times a billion to gomonkeygo for the fantastic artwork! 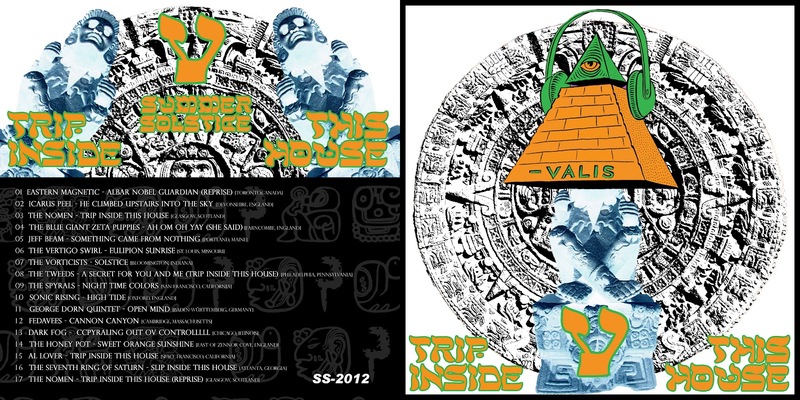 Get Trip Inside This House presents Summer Solstice,Vol. V here! Labels: Psummer's Psychedelic Psoundtrack. Vol. V. 2012. Solstice. Wow Valis, this looks stellar, downloading now and will listen to it as the sun rises tomorrow. Merci Beaucoup. Wow! Volume 5??? CONGARTULATIONS Valis and all the participating artists!!! Happy Summer! Fantastic stuff. Can't wait to get me head and ears 'round this. As always, I KNOW it'll be a blast. Thanks valis and all the bands involved. By jove, you've done it again! Wonderful selection of talent, eh? Wow! This looks fantastic, but the download link is now dead. Is there any chance that you could re-upload this, please? I'm a bit late for supper it seems, but I'm still hungry! I really enjoyed the one you did in 2010. Let me see what I can do dayglo. Thanks for the kind words, too.